Freedom Shores – One step beyond …. The story of Freedom Shores began when the owners fell in love with a beautiful hidden valley on the outskirts of Airlie Beach in the Whitsundays Region, Queensland. They bought the valley with the vision of sharing its unique vista with others. The nautical focus for the property now called Freedom Shores originated when the business acquired the old Shute Harbour jetty poles. The jetty was being refurbished and these poles had character and beauty worthy of being saved. 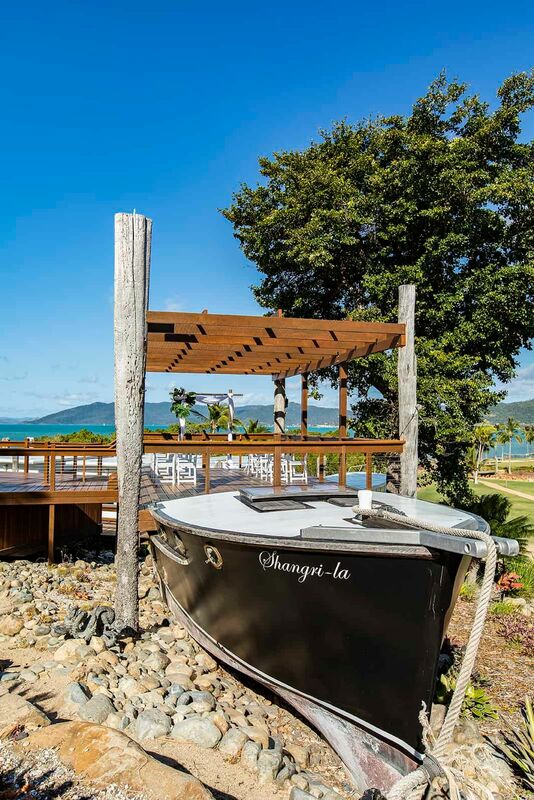 The timber inspired an entire resort built around reclaimed boats to create a truly special accommodation right on the water at Woodwark. The Freedom Shores team began saving old boats destined for destruction and recommissioning them as nautical interest points throughout the grounds. The piece de resistance is the “Shangri La”, a part of General MacArthur’s fleet during World War 2, which has been given pride of place at the entrance to the resort. Some of the palm trees within the grounds came from the film set of the movie “The Pirates of the Caribbean”. The trees were used on set when filming in the Whitsundays, but had no future use past that event, so once again the Freedom Shores vision scooped up these lovely specimens and planted them within the hidden valley. Freedom Shores was originally named after The Doors song, Waiting for the Sun -Standing there on freedom’s shore- lyric. At Freedom Shores visitors can stay in a Boat Bungalow, dine at Northerlies Beach Bar and Grill with a great selection of craft beers and boutique wines, enjoy a menu developed by our inspired Executive Chef Zibby Deca, or just soak in the view of the water’s edge with a cocktail in hand and a moment of relaxation.